No, we have the same as the UK spec indicators and headlights (P45t). 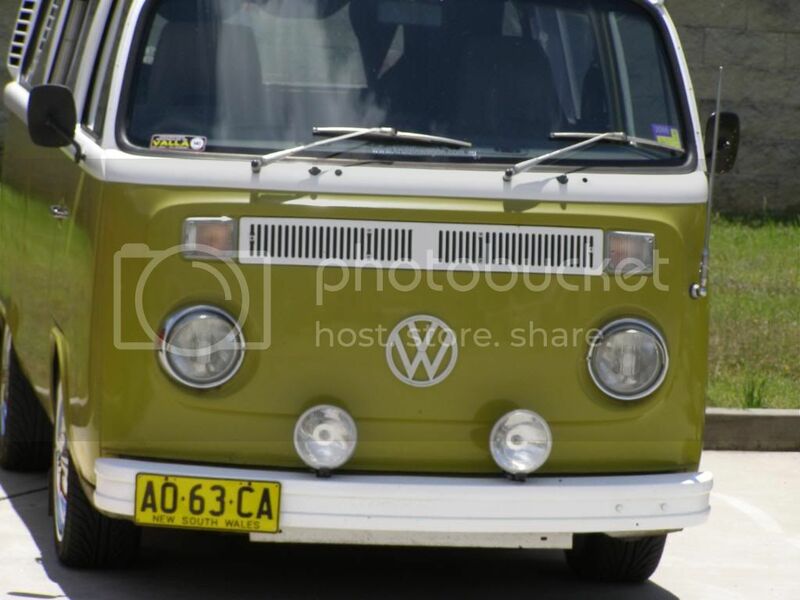 I surmised that Australia & British specification, 1968~79 VW Type 2 headlamps and direction indicators, would probably be the same! The reason I posed my question, is that the clear direction-indicator lenses, transmit an orange hue, from only part of the lamp unit, the outboard region, corresponding to where the BA9s side-marker light bulb would be, is completely colourless. I am not keen on direction indicators with clear lenses and orange-glass envelope bulbs, which seem to be less noticeable, than lamps with orange lenses and clear bulbs! My intention in the future, is to retro-fit some 1968~72 VW Type 2 direction-indicator lamp units, using either these, or the existing 1973 VW Type 2 direction-indicator lamp units, together with clear lenses and 20W quartz-halogen bulbs, as daytime-running lights, when their use becomes obligatory within the European Union, from circa 2011. I might even use some North American specification, VW Type 2 direction-indicator lamp units, to have both the side-light and daytime-running light functions, in the same lamp unit. Don't bother with the 20W quartz-halogen bulbs as they are rubbish. I bought some at great expense to improve my stop lights. I put one in and asked about ten people which was the brightest. They all said that they were the same or picked the standard bulb. I think that LEDs will be the future. I was also thinking about LEDs, which consume much less power and which seem to be the de facto light source for factory-fitted DRLs on modern cars. There are on-going developments re low-cost, high intensity white LEDs, so I will refrain from buying any for the moment. Quartz-halogen bulbs, are not ideally suited to short-duration, intermittent use, such as brake lights or direction indicators, because the iodine and inert gas within the quartz envelope, probably doesn't have sufficient time to attain the minimum operating temperature, to inhibit filament evaporation. some of those conversions looks really spacious. My conversion was done by Modular Camping Industries, Brookvale NSW. At least that's what the sticker on the front says. I haven't got too many pics but the following will give you some idea. The first is a fridge/stove which was located just inside the door. I have removed it to give more room and now use a portable Waeco fridge and open fire or small butane stove. The stoves reside in the trailer I tow when camping. Opposite the door is a cupboard where clothes can be hung. In the bottom of this cupboard is a area that was set aside for the second battery. I have my AGM battery in that area. Looking back from the walkthrough towards the back seat shows the rest of the cupboards. You can see what looks like a tray on the cupboard under the window. It in fact closes the hole where the sink used to be. I removed the sink as it was useless if the bed was made down. The back seat converts to a full size double bed. You can also see an aluminium strip on the front of the cupboard. This is where the table attaches. I don't use the table as the bed stays made down when I travel. I use a folding table outside the van. Much more practical. I have also converted the cupboards near the bed to be sliding (upwards). This photo still shows the cupboards hinged. There is also storage above the bed. Originally was for battens to make up the bed in the pop top. Hope this helps to give you a picture. Very soon, all cars sold within the European Union, will have daytime running lights, so buying a Volvo or Saab, would be un-necessary from this standpoint. Many marques and models, are already factory-equipped with daytime running lights. If I want to remain legal with the 1973 VW Type 2 Westfalia Continental, I will either have to drive during the daytime with my 100/80W H4 dipped beams on constantly or retro-fit some form of daytime running lights, such as the following universal kits, which were sold in Sweden, during the 1980s. The rotary knob, on the two-pane louvre window, opposite your sliding door, looks exactly like those of the three-pane louvre windows, fitted to the 1968~79 VW Type 2 Westfalia campervans!?! That's correct. Some people have mistaken it is a Westfalia conversion but no it is a Sydney conversion. A few months late really, but in case you were still wondering I believe that the Sunliner info you have is incorrect. I have a Sunliner '76 and did a bit of research when I got it. For as long as my dad can remember Sunliner have been located in Bayswater Victoria, one suburb over from where we live. He moved to this area around 25 years ago so that puts them there in the early to mid 80s. I have also had a few email conversations with them and from everything they've said, it seems that they have been in the area since they started in '74. Obviously not sure if it's the same as what it used to be. Hope that gives some information on one of the less well-known conversions. On a side note, the only two Sunline 70s conversions I known of (mine and another KC members) are in the eastern suburbs of victoria, near-ish Baywater. Doesn't specifically mean that they were made around here, but it's a chance. Also, there are LOTS of later 80s and 90s conversions in the area. I for one, have never heard of this conversion. If Madcampers's 1979 VW 18/2000 Type 2 was exported to Great Britain in circa April 2007, I would be interested to learn who bought it, so that I might be able to compile a feature article for Transporter Talk and/or Volkswagen Camper & Commercial. To be honest I'll be checking if there is an easy way to remove my roo bar on the new van when driving in the city. 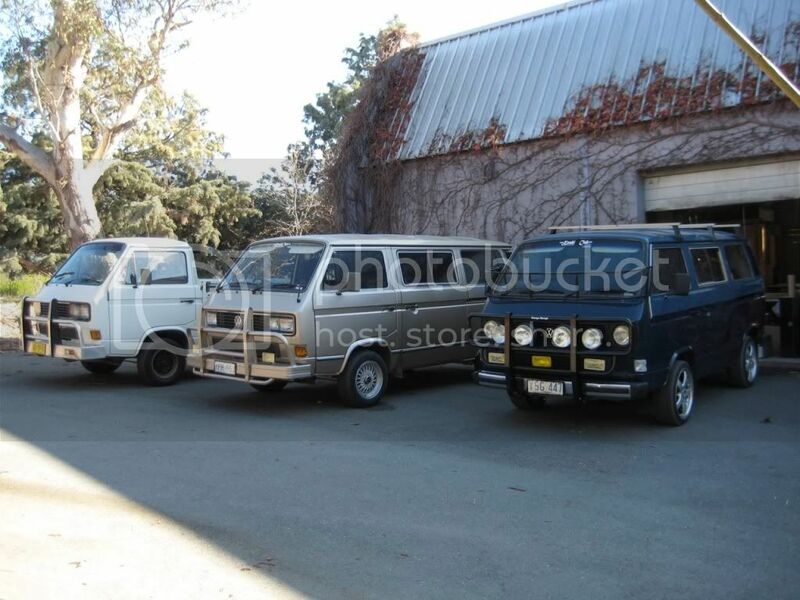 In the 12 years that I have been driving the van I have had no issues in the urban areas. I did hit a roo not too far from home and that certainly saved the front end. Certainly where I tend to travel the bar is a must have as animals tend to stray on to the roads. I do not drive at night if I can help it as around here there are far too many roos at present. The bar also doubles as a very handy place to hang towels when we are camped. At this stage there is no law regarding the bull bar and urban driving. There are laws regarding protruding objects from the bull bar, e.g rod holders. From what I have seen this is not policed that well as many vehicles still have them fitted. Also many vehicles mount a bike across the front which also does not comply.